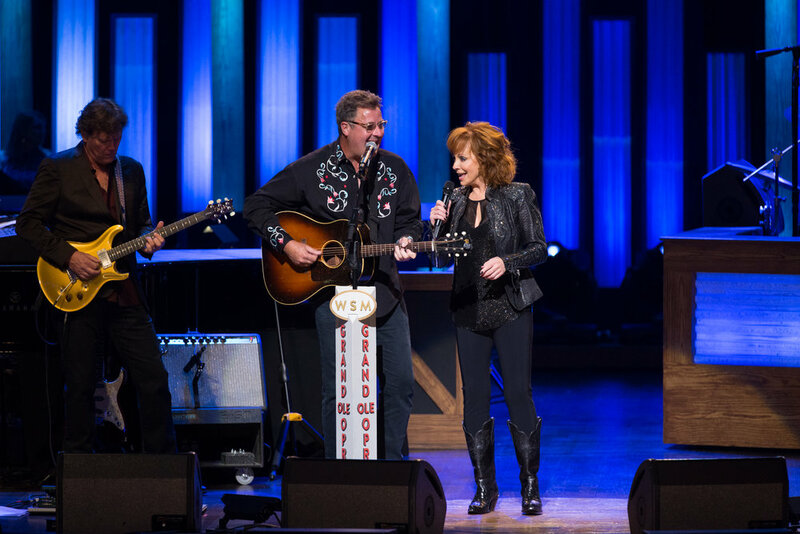 Superstar Reba McEntire celebrated the 40th Anniversary of her Grand Ole Opry debut with two sold-out shows and surprise guests on Friday night (9/22). Reba’s sets included the first song she ever sang at the esteemed venue “Invitation To The Blues,” her induction song “Somebody Should Leave,” theme song “Survivor” from her six-season sitcom Reba and signature “Fancy.” Fellow members Vince Gill and Carrie Underwood joined for “Oklahoma Swing” and Grammy-winning “Does He Love You,” respectively. Inducted into the Opry family on January 17, 1986, Reba’s recent return to the circle also featured surprise guest Dolly Parton, who recounted when she made a last-minute Opry appearance on the night of Reba’s debut. Unknowingly reducing Reba’s set to one song, on Friday night Dolly jokingly “gave the time back” and sweetly celebrated her friend. Adding to the evening’s excitement, RIAA President Mitch Glazier surprised Reba with a plaque to commemorate more than 40 million in RIAA certifications across 27 albums. Reba is second to only Barbra Streisand for female recording artists with the most GOLD (or higher) albums, which count sales and streams in the United States only. 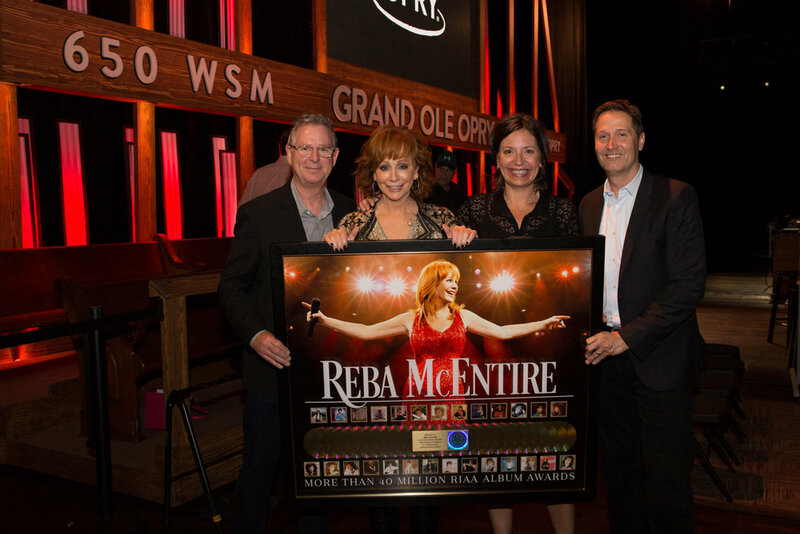 The accomplishment enhances the over 56 million total albums Reba has sold worldwide. Following last year’s limited release – and featuring collaborations with Vince Gill, Amy Grant, Darius Rucker and Lauren Daigle – MY KIND OF CHRISTMAS will be available everywhere on October 13 on Nash Icon Records. Fans can pre-order special bundles now at RebaStore.com. Tapped to host the two-hour CMA Country Christmas, Reba brings the season’s classics to life on the ABC Television Network November 27 at 8/7c. The Country Music Hall of Fame member has been honored with numerous accolades: AMA, ACM, CMA, Grammy and People’s Choice Awards. Reba is currently nominated for two GMA Dove Awards for Bluegrass/Country/Roots Album of the Year and Song of the Year (“Back To God”) from SING IT NOW: SONGS OF FAITH AND HOPE (Nash Icon Records / Capitol Christian Music Group), which topped both the Billboard Country and Christian/Gospel charts for multiple weeks. The feat marked her thirteenth summit, bolstering Reba’s successful record of 35 No. 1 singles. As part of the longest-running Country act in The Colosseum’s history with superstar pals Kix Brooks and Ronnie Dunn, REBA, BROOKS & DUNN: Together In Vegas is in its third year at Caesars.